I learned the meaning of the word “incumbent” when I was 11 years old. So "incumbent" meant our current mayor, Richard J. Daley. But who or what was a Lar Daly? Lawrence Joseph Sarsfield Daly, that’s who. He was born in 1912, lived on the South Side, was married, and had five children. He operated a business that sold bar stools. What made him famous was his hobby. He ran for public office–and lost. He did it about 30 times. Strangely enough, in his first campaign, he actually won. 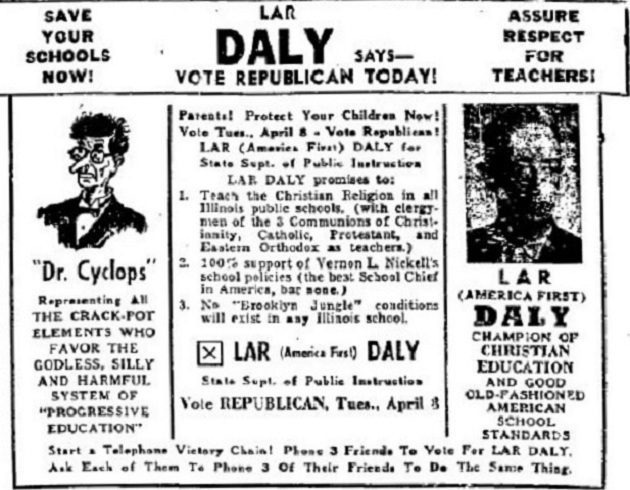 In 1932 Daly was elected a Republican ward committeeman. Then it was discovered he was only 20 years old, and not eligible for the job. He next ran for Cook County Superintendent of Schools in the 1938 Democrat primary. He began using the name “Lar” because he thought it would win him some Swedish votes. It didn’t work, and his losing streak began. Daly was an equal-opportunity candidate. He ran on whichever ticket gave him the best shot at victory. In the 1959 mayoral primary, was a candidate in both the Democrat and Republican contests. In philosophy, he was a Libertarian. He favored legalized gambling, was against public education, and called for major tax cuts. He was also a staunch isolationist–he billed himself as Lar “America First” Daly. Often he campaigned wearing an Uncle Sam suit. People who knew him well liked him. He played the fiddle and loved to entertain friends at parties. He was also a pretty good public speaker, with a rich, baritone voice. In a way, Daly was responsible for the Presidential Debates. Federal law said that radio and TV stations had to grant equal time to all candidates. Daly routinely filed appeals when he was denied access–and in 1959, the FCC ruled in his favor! Local Chicago stations were forced to give him free air time. To make a long story short, Congress soon rewrote the laws in question. When Kennedy and Nixon squared off in their historic 1960 debates, Lar Daly was nowhere to be seen. So he went on, running and losing. 1962–U.S. Senate . . . 1963–Mayor of Chicago . . . 1964–Governor of Illinois . . . 1966–U.S. Senate . . . 1967–Mayor of Chicago . . . 1969–13th Congressional District special election. And so on, and so on. In 1973, Daly won the Republican primary for the 7th Congressional District special election. That wasn’t hard to do, since he was running unopposed in a heavily-Democrat district. In the general election, he was clobbered. Politics costs money, even at Daly’s level. During the 1970s he began appearing without the Uncle Sam suit. Rumor said that he’d had to pawn it. His last campaign was the Republican U.S. Senate primary in 1978. Running against Charles Percy, Daly polled 74,779 votes–at 15%, his best showing in years in a contested election. A month later, Lar Daly was dead. Today he remains a legend among local political junkies. A story I heard confirms this. In 1948, former Minnesota governor Harold Stassen almost became the Republican nominee for President of the United States. That near-miss did something to Stassen. For decades afterward, he ran a string of unsuccessful campaigns, and eventually became a national joke. So when Stassen died, a Chicago commentator was asked to describe him.